Edinburgh’s New Town is a designated UNESCO World Heritage Site. Considered to be one of the world’s finest examples of Georgian architecture, it was built in stages between 1767 and 1850 by renowned architect James Craig. The New Town was built to tackle overcrowding in the Old Town and prevent the city’s richest residents from moving to London as a result. Sir Arthur Conan Doyle (author) was born here, as was Alexander Graham Bell (inventor). JM Barrie (author) lived in Great King Street – just round the corner from Scotland Street, the novel by Alexander McCall Smith. Right in the heart of the City Centre and north of Edinburgh Castle, the area is home to restaurants, bars, galleries, cafes, coffee shops, delicatessens, shops, boutiques and supermarkets. Properties in the New Town are a mix of Georgian townhouses, flats and mews houses, offering their residents period features, high ceilings and generous room proportions. Many properties have access to a range of beautiful, highly coveted keyholder only gardens. 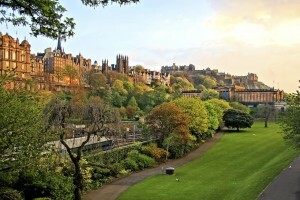 The New Town hosts Edinburgh’s main shopping streets, Princes Street and George Street, as well as a number of galleries including the National Gallery of Scotland, the Royal Scottish Gallery and the Scottish National Portrait Gallery. George Street is lined with cafes, bars, restaurants and nightclubs, including Tigerlily, Contini, Le Monde, Jamie’s Italian and Opal Lounge. The New Town is considered to be the City Centre. It has excellent bus links and includes Edinburgh Waverley train station. If you have a car, most properties offer on-street parking. However, usually a permit is required. This can be arranged through the Edinburgh City Council. There are a number of excellent local Primary Schools, including Broughton Primary School, Stockbridge Primary School and St Mary’s RC Primary School. The New Town is in the catchment area for Broughton High School, Drummond Community High School and St Thomas of Aquin’s RC High School, but is also in easy reach of a number of public schools including Erskine Stewart’s Melville Schools, St George’s School for Girls, The Edinburgh Academy, George Heriot’s and Fettes College. In between Stockbridge (EH4) and the Old Town (EH1), The New Town is also close to Fettes (EH4), The West End (EH3), Broughton (EH1) and Inverleith (EH3).